Here I sit on the back patio in Phoenix. The sun is low in the sky. It’s beginning to cool off. A slight breeze sends the gentlest of riffles across the pool as I watch. A mother bird scrambles to feed the babies nesting in a hole in one of the Saguaro cacti. Our intrepid little C.Bear is staring intently at “Mr. Cactipus” to show he’s not afraid of him any more. The neighbor’s rooster has taken it upon itself to begin crowing at 4PM, but we don’t mind. This is vacation. This is a perfect evening to be outside. This is a perfect time to reflect on all of life’s little inconsequentials, and on fun things too. At any time, should I want to note any of this down, my AlphaSmart is just a few steps away. I can sit in the shade, sip my iced coffee, hear Mrs. Bird wrangling with the noisy little ones, and jot a note on my AlphaSmart as the mood strikes me. And that’s where we came in. My AlphaSmart 3000 arrived in February of this year. It hasn’t torn me completely away from my favorite computers, and I don’t really want to see that happen, but it’s an encouraging change in work habits. For me, my AlphaSmart offers a different and somewhat more natural way of living. The AlphaSmart is a lightweight, truly portable writing tool for authors, students, professionals, note-takers and people on the go. Without carry case or accessories (included), AlphaSmart weighs about 2 pounds. It measures 12 x 9 inches, and stands 1-5/8” high at the LED readout, or about 1” high at the keyboard. AlphaSmart runs on 3 “AA” batteries for about 300 hours. It easily interfaces with just about any Mac or PC via USB, infrared, serial or parallel connection. The 3000 model supports up to eight 25KB files of plain text (ASCII). File access is toggled by function keys, for a total of about 100 pages of single-spaced text. 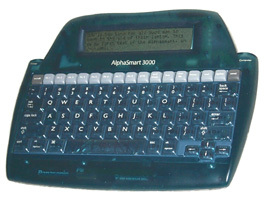 Users can transfer text from their AlphaSmart to the host computer via the cable or IR connection by just hitting the SEND key. A waiting open page in a word processor application on the host computer receives the text. 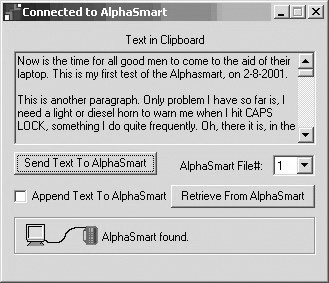 No special software is needed to move text from AlphaSmart to the host computer. The keyboard is easy to use, with adequate tactile feedback. Keys seem full-size, and key layout is about 98% of a full-size desktop or laptop keyboard. Keys and controls are clearly marked and easy to read. Keyboard shortcuts are extensively supported, but shortcut memorization is not required, and every key does what a user would expect it to. Readout is a crisp four-line LED. Page navigation is well thought out. Supported text processor functions include Find and Spell-check. Advanced features of interest include Smart Applets, sticky keys, alternate keyboard layouts, international characters, a keyboard (typing) timer, and password protection. The AlphaSmart 3000 IR includes keyboard unit, carry case with strap, USB cable, and manual. Batteries are included. It may be purchased through the well-designed and informative AlphaSmart web site. The 3000 currently retails for $199, and the IR model retails for $229. Other accessories are offered for sale, but everything the user needs to begin is included out of the box. Advanced users may want to look into the inexpensive ($29) optional GET software utility. If the GET Utility is installed on the host computer, it can be used to move text in either direction. This could be useful if you had a requirement to pre-load files into the AlphaSmart (“Send Text to AlphaSmart” – see Figure 1). In “Retrieve” mode, the GET Utility is an alternative to hitting the SEND button on the AlphaSmart. The SEND button loads text directly into open word processing applications, whereas the GET Utility transfers text directly to or from the host computer’s clipboard memory. The first thing I did was to take my AlphaSmart out of the box, put in three “AA” batteries, and start using my AlphaSmart. On the subject of technical documentation, I amaze my friends with my ability to maintain two seemingly opposite viewpoints at the same time. As part of my job as software QA person, I help critique and even create mountains of technical documentation. My views on concise, well-organized and clearly written product documentation are very strong. On the other hand, my years as a Mac user only cemented my view that a well-designed product should be understandable and usable by a motivated average person. Only airplane pilots should be required to use checklists to operate their product. The “human interface” guidelines assume that the machine should facilitate the task or project, not get in its way. The AlphaSmart 3000 User’s Guide is an excellent example of good product documentation, and you can find what you need to know quickly. Most importantly, the AlphaSmart product itself shows thorough planning in every detail of device operation and design, down to package presentation when you first open the box and begin taking out the components. You should only rarely need to use the user guide, and then only as a reference. This manual is very clearly written and organized, and is actually fun to browse. Details of file transfers vary slightly for Mac and PC, as you’d anticipate. User guide and online support and documentation for each platform is very thorough. Should you find yourself stuck on some fine point of operation and without your user guide nearby, just flip the unit over. You will find just about everything you could need in the way of reference, printed on the back of the device. I got as far as page 2 (“Quick Start – “for those of you who don’t like to read manuals”) of the user’s guide, before I started my “AlphaSmart Log”. The idea was to record my exploratory initial impressions of the product as I used it. My log is “ad hoc” and un-edited (not very well organized), and you can follow my first efforts to figure out as much of the operational features as possible without resorting to the manual. Later, I enjoyed my first taste of truly portable writing while cooling my heels at San Francisco International Airport. I appended these impressions to the log. You can read my AlphaSmart Log to see how it went. I did a demo of my AlphaSmart 3000 for the Peninsula Apple Users Group (PAUG) in April 2001. Member response was great. In fact, I had a tough time getting my AlphaSmart back from the members so I could demonstrate uploads and downloads to my laptop computer. One of our club members accidentally erased my AlphaSmart Log. (This is extremely hard to do accidentally, as you are warned and must override the warning). Since I had my backup on the laptop, transferring the file later was no problem. If you look carefully at figures 1 and 2, you’ll see the text of the Log being transferred back to file 1 on the AlphaSmart, just in case I decide to pick up where I left off. Our club vice-president noted that he had seen entire classrooms equipped with AlphaSmarts, neatly housed in rolling racks. AlphaSmart strongly supports the educational community, and you can find details of what AlphaSmart can do for students and teachers on their website, too. This kind of usage is eloquent testimony to the thoughtful design and durability of the device. I use the USB connection from AlphaSmart to my other machines. The “U” in “USB” stands for “universal”, but it ought to stand for “ubiquitous” (found everywhere). It is hard to find a machine less than five years of age, PC or Mac, that doesn’t have built-in USB. For 25KB transfers, USB is more than fast enough. So far, I’ve tested my AlphaSmart on Pentium III boxes (Tyan Trinity 400 and Asus P3B-F motherboards) and my Dell 3800 laptop. With or without a USB hub, both desktops interfaced with the AlphaSmart the first time. The AlphaSmart software and USB file transfer mechanism itself has worked flawlessly on all machines under either Windows 98SE or Windows 2000. I very recently bought one of the new 600MHz iMacs. One of the reasons I bought it was that I knew it had USB (and FireWire and Ethernet) connectivity. I have not had a chance to dock my AlphaSmart to it yet. Everybody I know who owns an AlphaSmart, also owns a Mac, so I would not be looking for any surprises here. The new OS-X is uncharted software territory, so you would most likely expect to run under Carbon (or just boot into OS 9.1) for file transfers. Much of this review was written or edited on a desktop computer, where I have ready access to my images and files. Parts of this were written on the AlphaSmart. The point is, you can’t tell which is which. Whether you create business documents, web content or that great first novel, AlphaSmart offers a degree of personal creative freedom that early laptop computer ads only promised. I trust my grip on a 2-pound AlphaSmart, but I just wouldn’t know what to tell the boss if 4,000 hours of work went tumbling to the bottom of the pool or the Grand Canyon. Inside many a geek, is a Luddite waiting to get out. When some people want to write down a quick note, they just grab a pencil and paper. I stopped laughing years ago, because I do the same. I was captured by the creative excitement inherent in the early Apple II, and then the Mac, and I never lost that excitement. But the operating systems, fancy 32-bit desktop pictures, icons and sound files, the control panels and power applications, and even the mighty World Wide Web itself are nothing without the power of the written word – plain text. The awesome power of chip-driven devices has little or nothing to do with what the instrument could do for you and the creative process. What you have already accomplished with the device, be it a pencil and paper notepad, is everything. If a chip-driven device empowers you to start your project, where pencil and paper or the old electric typewriter just did not, you’re well on your way to creating something that could not have existed in your life before. My AlphaSmart fits well into this catalyst role, as well as being an excellent writing tool that is a pleasure to use. Thanks, AlphaSmart. I created the AlphaSmart Log and parts of this review with my AlphaSmart. I also created high-level programming guidelines for a Perl database project I’m developing. Those guidelines probably saved the project. Best of all, most of this time would otherwise have been “dead space”, time that otherwise would have been wasted at airports, with my perfectly good laptop sitting in its perfectly good leather case. 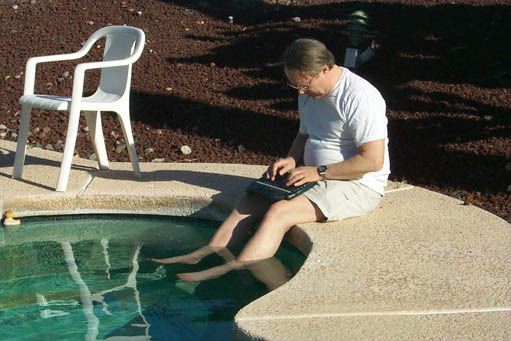 Quality Time can be soaking your feet in the pool (see photo below), but if you just want to jot a few notes without switching from relaxation mode to work mode, try an AlphaSmart. With a 100-page capacity on the AlphaSmart, you could create something quite a bit bigger, too. I’ve heard of people taking laptops on backpacking treks. I’d definitely consider taking an AlphaSmart on this kind of a trip, but not a nine-pound laptop with four-hour batteries. An AlphaSmart fits comfortably into the crannies and free space in your life, where larger devices may not. PDA’s may help you get organized – I do not own one – and I understand you can shop with them, get your mail, and walk on water. Their time may come, but I don’t see them as a credible writing tool. Today’s proliferation of intelligent writing and communication devices is startling. We see wristwatches, cellular phones, PDA’s, “toaster ovens” (network devices) and television sets all completing with personal computers for your email, entertainment, stock trades, and purchasing power. The most popular input device is probably the stylus … need we say more about credibility? … followed by 400-button TV remote channel changers. Are they practical, and for whom? Only time will tell. Where does the AlphaSmart fit into all of this? My hope is that AlphaSmart doesn’t cater to these distractions. When my AlphaSmart starts reminding me that I have mail, or that I have a noon meeting, or that someone I have absolutely no interest in talking to is waiting for me in Chat Room, I’m outta here. I just want my “PWA” – personal writing assistant..
Other devices may have had more impact on our society and personal work habits, but I think AlphaSmart is one of the best-designed writing tools to ever have come out of the computer revolution. I’m delighted and grateful I own one. Illustrations: Figure 1. The Get Utility transferring a file (Windows 2000 to AlphaSmart). Note the text in the utility window. 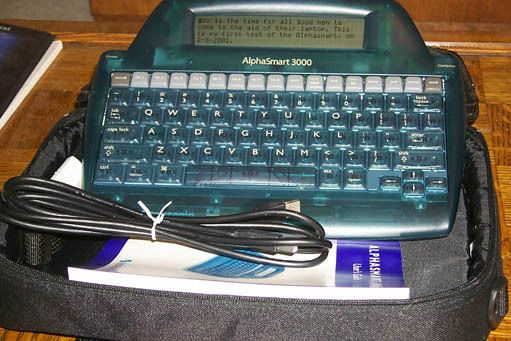 Figure 2: My AlphaSmart 3000 in its case. Note the text in the LED window. Figure 3. The AlphaSmart is light enough that you can get away with this kind of casual use. I wouldn’t try this with a 9-pound laptop with the screen flipped up! This entry was posted in Review and tagged cool stuff, Hardware, organization by . Bookmark the permalink.